Maize Break - Africa’s most outstanding source for news and information; is the brain child of my extremely talented wife, Malaka. One day, about a month and a half ago, she she dropped an interesting idea to me for a new website that featured satirical and ironic news and information about Africa and the African Diaspora. The thing that seemed to trigger this is that she kept seeing bad and depressing news about Africa and African issues on major news websites; nothing upbeat and humorous. We all ways see children with flies in their nostrils, or wars and mass graves. Surly, there are obvious tragic stories we see about Africa almost daily, But is there still not any humor and life to be found somewhere….? My wife is from Ghana, West Africa an one thing about I’ve learned from being with her these past 11 years, is that she and her family (especially her crazy Dad) know how to laugh at them selfs. This humor has translated to a full blown news website featuring absurd content, and fantastic satire. 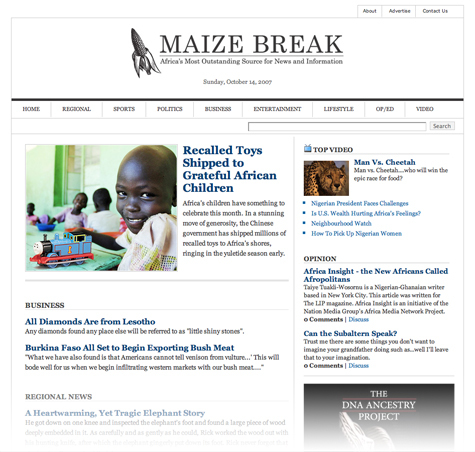 Maize Break - Africa’s Most Outstanding Source For News And Information. This blog is a good inspiration for my upcoming blog theme, nice job! All of them are totally untrue stories. My wife wrote all of them except for a few of the opinions. She’ll be gassed when I pass your complement on.